Abstract art seems to be having a moment at present. Galleries are displaying works by established and up and coming artists as if abstraction in itself has something to say, divorced from any context, and as if the form itself is an act of artistic exploration. Many of the pieces are samey or feel produced with a fashion or a buyer at the fore. Abstraction, perhaps, should be questioning or create a impact on the viewer. What might be seen as a more traditional figurative art is reduced very much to the status of second class citizen, offering chintzy glimpses into some realistically rendered landscape or portrait. This tension – in some ways reminiscent of Turner, but with a contemporary twist – doesn’t only exist within the frame of the picture, but also the parergon- the light that both emanates from the painted surface, but also requires an external light-source to illuminate it – draws in the viewer. 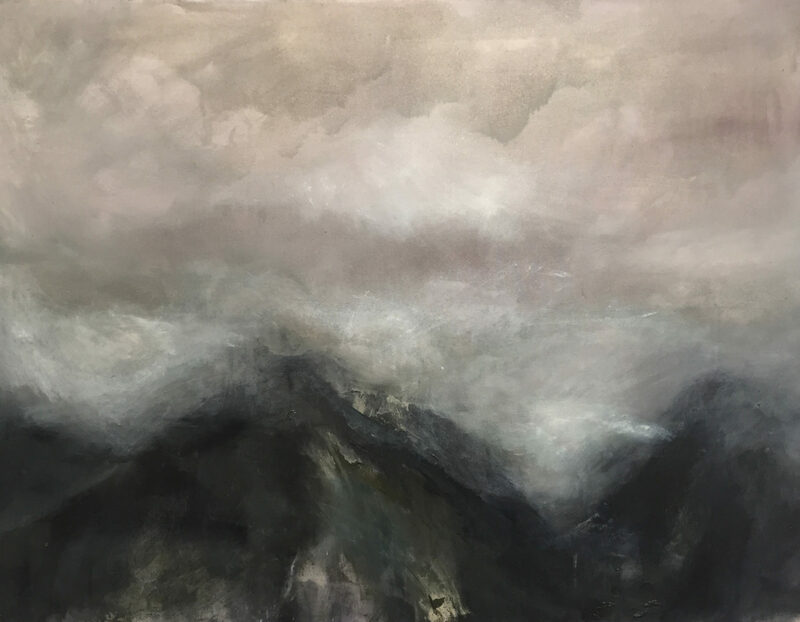 This is also a common feature with other paintings such as Misty Mountains, which displays the intensity of production through the removal and reapplication of the painted canvas, but also in the way that the final piece has been rendered so sensitively and emotionally. The framing of the painting adds to this effect. The space between the white frame and the edge of the canvas allows the drama of the creation to become visible and to show something of the process of the creation of the paintings. This is a bold move, as the temptation is often to erase the process of production from the finished piece. This brings me back to the title, and in particular the ‘meeting’ that takes place. As a metaphor this infuses all of Lily’s work, contemplating ideas such as ‘where does the sky meet the earth?’, “where does abstraction meet figuration?” “Where does production meet final piece?” The impulse is to provide answers to these questions, but Lily’s work leave these hanging, to be pondered by the viewer. 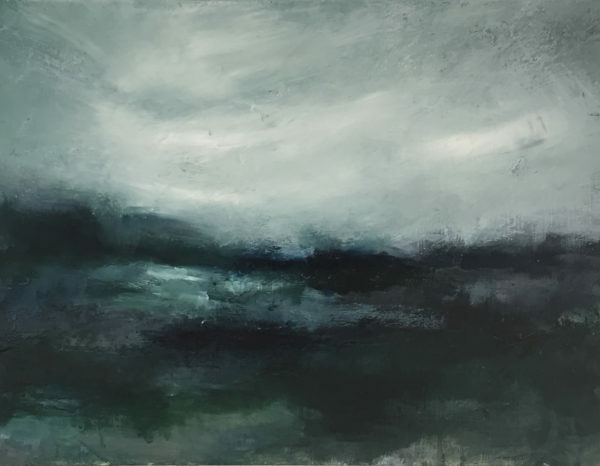 Where Sky Meets Land was exhibited at ONCA 3 – 11 November 2018.